(Charlottetown, P.E.I.) – The TD Confederation Centre Young Company is hitting the road again. After a busy 2017 season that saw two troupes crisscross the country, the 2018 company has been invited to perform at the Future of Child Welfare in Canada: National Child Welfare Conference 2018, October 23 to 26 in Calgary, Alberta. 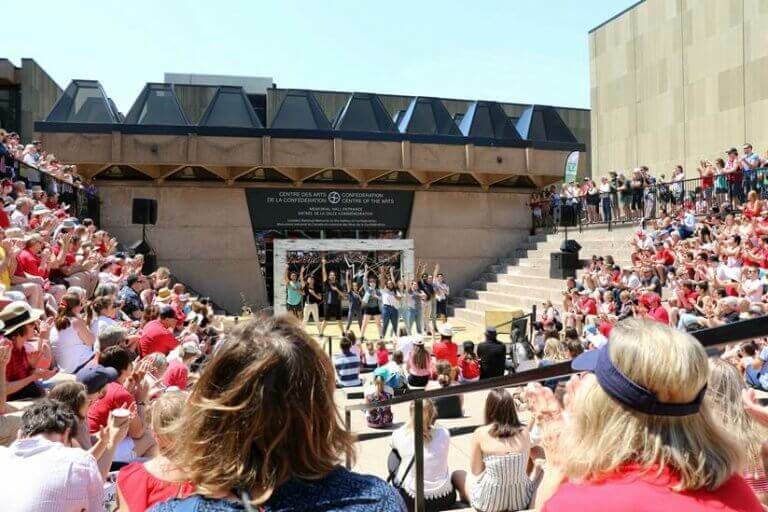 Photo credit: The TD Confederation Centre Young Company performing Aqsarniit in the outdoor amphitheatre at Confederation Centre during The 2018 Charlottetown Festival (Julia Cook photo). The Prairie Child Welfare Consortium and the Provincial & Territorial Directors of Child Welfare are pleased to host the first Future of Child Welfare in Canada: National Child Welfare Conference 2018, October 23 to 26 in Calgary, Alberta. The conference will focus on research and promising practices that effectively support vulnerable children, families and communities. Organizers hope to build on important national conversations occurring around effective practices and strategies for preventing Indigenous children coming into care, and supporting Indigenous children living with their extended families in their communities. The gathering is also a hub, sharing information about different models of governance while providing a platform for Indigenous people to express their own views about reform in child welfare. The conference will appeal to cross-sectoral, multidisciplinary service providers, Indigenous leaders and scholars, educators, government and agency staff, policy-makers and researchers concerned about child and family well-being. This national conversation seeks to build on the work of the Truth and Reconciliation Commission, the Human Rights Tribunal, and other significant national Indigenous strategies. The goal is for the shared work over the week to act as a catalyst that builds and adds to the momentum and energy building across Canada for a dramatically different and better system of child welfare.